Our love seats are generously proportioned, plenty of seat depth with a gently sloping back support higher than a standard garden seat. The centre table sits onto the arms so you have the flexibility to use the seats together or singly around another table or for movement around your garden to enjoy different seasons in different spots. These are great for use as additional or casual seating, for a pit stop in a large garden, or for use in an educational or visitor setting. The extended feet give the benches stability and the price and size make them an attractive and versatile option for your extra seating needs. Our single seats are perfect for adding to another table set for extra seating or for enjoying those small corners of the garden that are too small for a table but are too lovely not to sit and enjoy. With the same design as our garden benches they are comfortable and well proportioned. 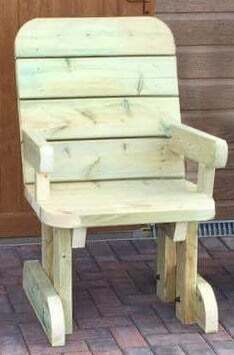 This is part of our handmade premium range and is made of construction grade 6×2 tantalised timber.